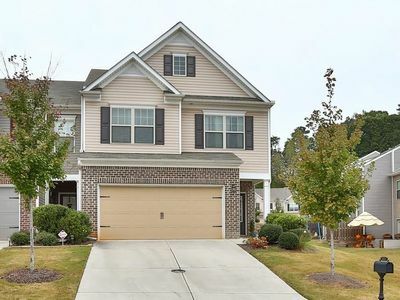 Spacious 6-bedroom house with HUGE great room and lots of space to roam! Welcome to Sweet Tea! 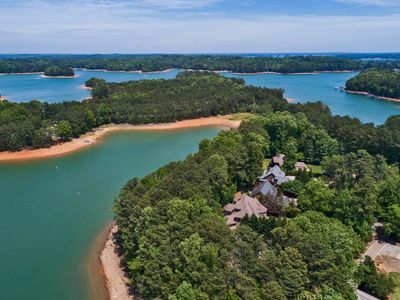 Our 3,800 sf luxury home sits on an acre of beautiful landscape in a highly-desired neighborhood with nearby access to Lake Lanier. 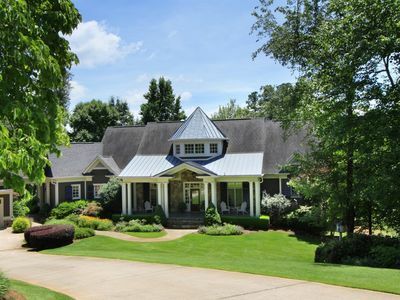 This property offers a perfect lodging option for your visit to GA whether you're coming for a vacation, reunion or special event! 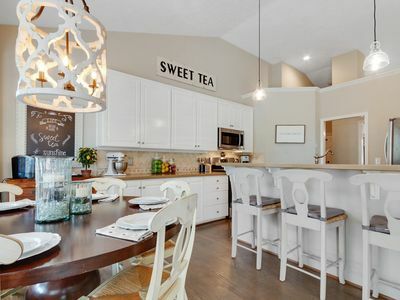 With seasonal lake views and under 7 minutes to sandy lake beaches, boat ramps, golf, hiking, shopping and more, Sweet Tea has everything you need. This spacious home has been professionally decorated with the goal of comfort and style to make your stay an incredible experience. • Your age and, if you are an all-adult group, the average age of your group members. • The maximum number of adults and kids that you will have (even if you don't yet have final numbers). • Any day guests that you plan to have at the house. • A little bit about the purpose of your visit to GA. What brings you out, what are some of the activities planned? • 6 large bedrooms with at least a king or queen bed. • Sleeps up to 13 guests in beds. 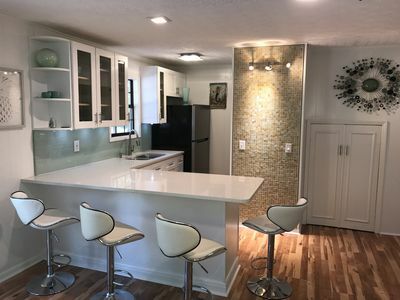 • Beautiful open kitchen with gas range, seating for 6, plus bar seating for 5. • Formal farmhouse dining room with seating for 8. • Main floor living room with flatscreen. 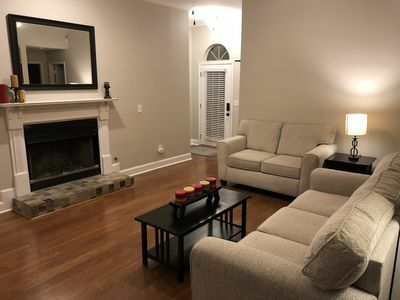 • Great Room with 12’ ceilings, 10’ bar, 50” flatscreen TV, pool table and fireplace. • 2 fireplaces (one on each level). 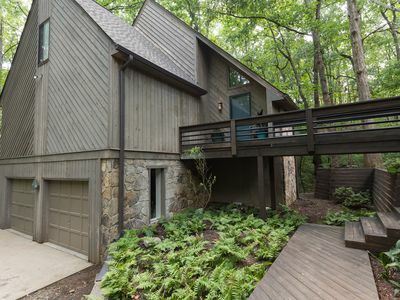 • Master Suite with bonus loft, private bathroom with jetted tub, double vanities and large shower with three heads. 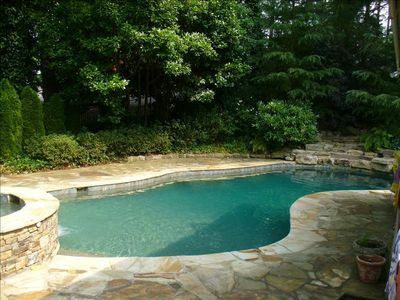 • Spacious exterior area with firepit and 6 Adirondack chairs, plus a platform area with additional seating. 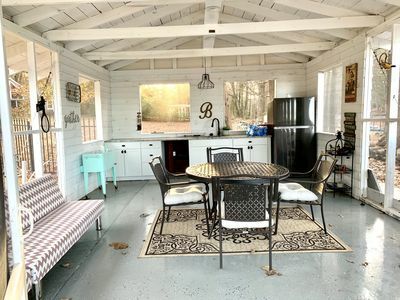 • Deck seating for 6 and outside grill right off the kitchen. 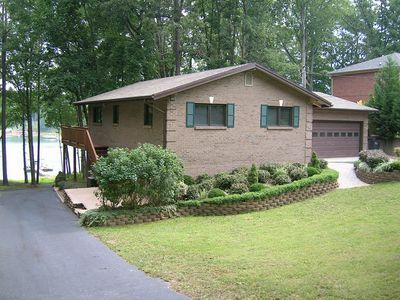 • TVs in Living Room, Great Room, Master, two other main floor bedrooms, and lower level bedroom. 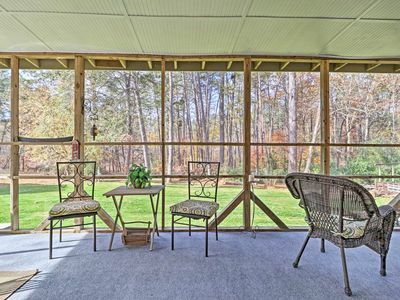 This home is located north of Atlanta, just minutes from Highway 400. • Master Suite – King. Private bath. • Bedroom #2 – King. Shared bath. • Bedroom #3 – King. Shared bath. • Bedroom #4 – King with twin daybed and twin trundle. Shared bath. • Bedroom #5 – King. Shared bath. • Bedroom #6 – Queen. Shared bath. 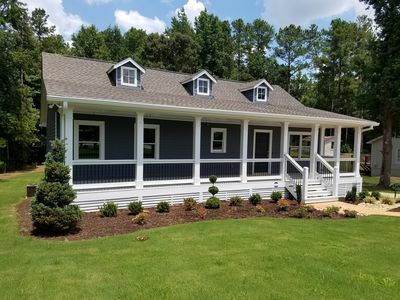 This home sleeps up to 13 guests (two per queen/king bed and twin trundle) and is ideal for large families, corporate retreats, and small group gatherings. 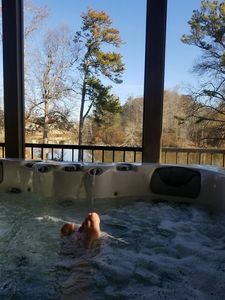 If you are looking for an incredible Georgia lodging experience, you’ve just found it. Come be our guest! 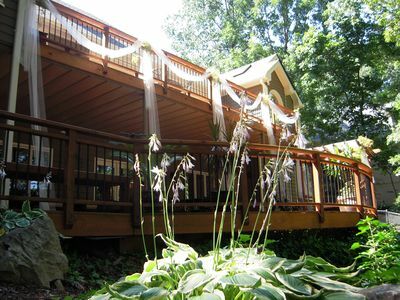 WE DO NOT ALLOW WEDDINGS, REHEARSAL DINNERS, BACHELOR/BACHELORETTE PARTIES OR OTHER FORMAL GATHERINGS AT THE PROPERTY. House parties (having day guests), unless pre-approved in writing with correct details, are strictly prohibited and grounds for immediate eviction and additional fees. Day guests will be charged for at $25 for each day guest per day, if not pre-approved in writing. Day guests are any guests beyond those paying to spend the night. 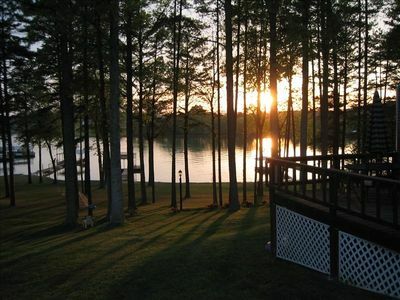 Summer bookings (June, July and August) require a 5-night stay with a check-out on Sundays. Christmas and New Year's are two different booking segments with 5-night minimums. Christmas bookings fall between December 19 and December 26 or 27. New Year's bookings fall between December 27 and January 7. Smoking outside only and absolutely no pets. Violation of these policies will result in a full forfeiture of deposit. • This house was chosen for its location to everything! 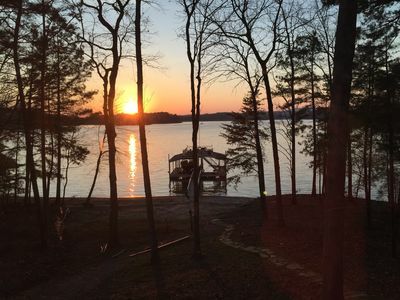 • We are minutes away from sandy lake beaches, boat docks, hiking, golf, shopping and more. 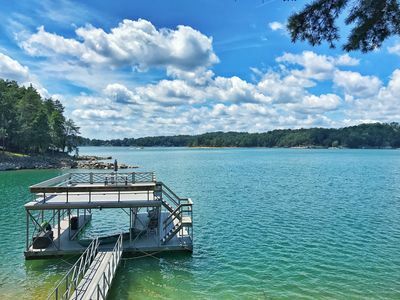 • We are 30 minutes to Lake Lanier Islands resort and Lanier World waterpark. • We are 30 minutes to the N. Georgia Mountains. • We are a little over an hour to Hartsfield-Jackson Atlanta International Airport (normal traffic times). Please note that we sometimes receive multiple inquiries for the same dates and reservations are ONLY confirmed once payment has been made. Unfortunately we cannot hold dates. If something happens to the point that the house is not habitable, owner is only responsible to refund any received payment for unused nights. We take great pride in our properties, but guests must realize that things break, and owner has a team available to address any problems that may occur. No refunds will be available if owner makes reasonable efforts to correct these problems during the guests stay, and the house is still habitable. • Reservations cancelled 60 days or more prior to your arrival date receive a full refund less a $200 service fee and the VRBO service fee. • Cancellations less than 60 days in advance will not receive a refund. • No cancellations due to weather. When you purchase your stay through VRBO/Homeaway, they do offer cancellation insurance that you can purchase. We suggest reading the fine print if you decide to buy this insurance since we have no control over their regulations. Thanks for looking and for making it all the way to the bottom of our listing description! 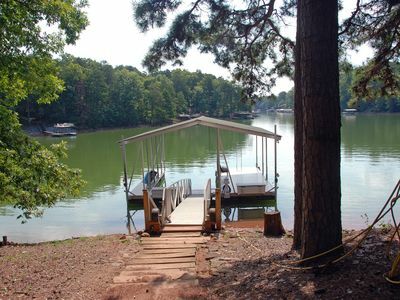 Private dock and Lake access. all bedrooms have lake view. 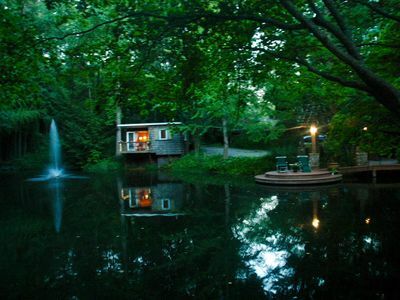 Private Retreat? Group Getaway/Event? Near Everything? ULTRA-Nature? ...YES!!!!! In between houses? 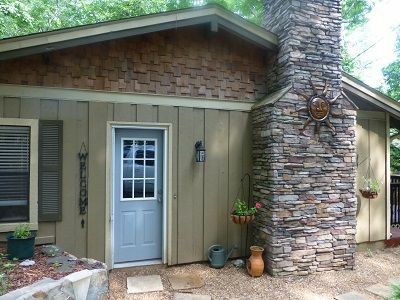 Nice 4br walk to Lake Lanier close to exit 14 monthly rates!